Laine Tyerman, died peacefully on December 19th, 2018 in Seattle, WA, surrounded by family and friends. Beloved wife, mother, grandmother, and great-grand mother. 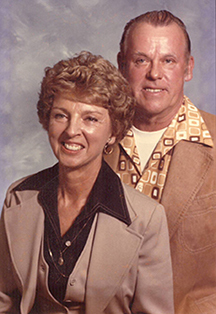 Laine was a born May 24, 1927 in Kent, Washington to Fred Boback and Gertrude Manowski-Boback. She attended Kent Meridian high school. Her employment at Boeing in support of the US WWII effort brought her to Seattle. On September 24th, 1947 she married Henry “Hank” Tyerman of Black Diamond and eventually settled in the Queen Anne neighborhood of Seattle, where they spent most of their life with their 3 children, Mark, Joan, and Susan. She became a leading realtor in the Queen Anne/Magnolia neighborhood working over 20 years for Larry Apple/Thurmond’s Central Realty. Laine’s life was one of adventure. A consummate traveler, she and her family took frequent trips to California, Nevada, Hawaii, Mexico, and Europe. Her favorite place was the beaches of Mazatlãn. A testament to her wandering spirit, she enjoyed her last trip solo to Mazatllãn, at the age of 90. When not traveling she often could be found in the casinos of Western Washington playing her favorite slots. Laine also had a deep affection for her family, and provided unwavering support to her children, grandchildren, and great grandchildren. Whether it was attending countless sports events, or cheering at school graduations, Laine was always there. She was preceded in death by her husband Hank, father Fred, mother Gertrude, brothers Robert and Fred and her daughter Joan. She is survived by her son Mark (Colleen), daughter Susan (Jay), and grandchildren Shelly Decaro (Michael), Erin Sponaugle (Nick) and Zachary Tyerman. She is also survived by her 4 great grandchildren, Alex and Anthony Decaro, and Fiona and Amelia Sponaugle. Laine’s spirit and support will be greatly missed. A funeral service will take place at St Anne’s Parish, 103 W Lee Street Seattle 98119, Friday December 28th at 11am.